We came to Marham at the end of a busy day, and at last the shower broke. It had been threatening all day, but it did not last long. In the wake of the rain, the sun broke out more strongly than before, and the graveyard of Holy Trinity was filled with the intense fragrance of high summer. The birds recommenced their busy chatter, and insects lifted across the high grass in the rising heat. It was as lovely a place as we had been all day. I was travelling with local historian Paddy Apling, who is a retired food scientist. 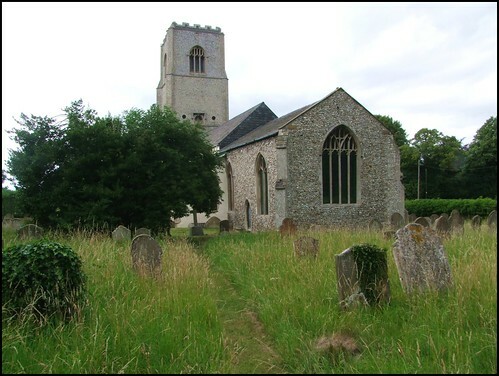 In just one corner of Marham graveyard he identified no less than twelve different species of wild grass, at least one of which was rare. The dead of Marham lay all around. These days, I suppose, the parish is best known for the huge air base which lies between here and Swaffham, but this was also a busy place in early medieval times. Domesday noted two churches, and on the north side of the nave is a grand Norman doorway of a style which Sam Mortlock observed is found only once elsewhere in Norfolk, on the north transept of Norwich Cathedral. Otherwise, the church is largely a result of the local farming wealth of the 14th and 15th centuries, and you step into an interior which still speaks of that period. The arcade which separates the nave from the south aisle is from towards the end of this period, while the font is a fairly spectacular example of the early 14th Century, its panels depicting a variety of Decorated tracery. On the other side of the great Reformation divide is one of Norfolk's best sets of James I royal arms, curiously placed inside the north wall of the tower, where many people must miss it. There is a most curious sight at the east end of the south aisle. As the Tudor period ended, and the puritans began their rise to power under the early Stuart kings, there is a rapid deterioration in the quality and style of English memorials, a result perhaps of puritan suspicion of the vanity of art and education. In 1604, John Steward and his wife were buried here under what looks like half of a fairly monstrous six-poster bed, their sleeping effigies watched over by a maudlin lion and garishly recoloured in recent years. Folding chairs and a large display screen had been stacked against it, as if the parish were faintly embarrassed by it, and perhaps no wonder. We put them back carefully after photographing the thing. Aside from this, I liked very much the sense of a busy 19th Century piety in this church, all of a piece with some of the fine Victorian houses on the road to Shouldham. It is easy to imagine the minor characters of certain Trollope novels making their way down the village street of a Sunday to settle themselves into the pews. One of those 19th Century worthies, Henry Villebois, was thought of highly enough for a memorial to be placed behind the pulpit to him by the great Richard Westmacott, a sculptor best known for his frieze on the front of the British Museum in London. Two angels rest in contemplation in front of the inscription. Mortlock was uncharacteristically harsh about Westmacott's work, observing that it is competent but uninspired. In truth, this memorial might seem more impressive if it was not so awkwardly placed. Outside, well-carved and substantial Victorian gravestones kept a kind of contemplation of their own, peeping their heads above the waving ocean of Marham's burgeoning wild grasses.